In core training the drawing in maneuver is the most important core exercise to master if you want to increase the stability of your lower back. Physical Therapists use the drawing in maneuver to re-train the deep muscles of the core and improve spine stabilization. One cause of lower back pain is instability. When the spine is unstable, the joints move more than they are designed to and the joints suffer extra wear and tear. Increasing both strength and coordination of the deep core muscles can increase stability and decrease the pressure on the lower back. The 2 most important core muscles for increasing stability are the transversus abdominus and lumbar multifidus. The transversus abdominus (tva) as its name implies runs across the abdomen. This deep abdominal muscle has only one function-- to stabilize the lumbar spine. The tva pulls in the belly button and compresses the abdominal contents. Physiotherapists in Australia found that the tva was the first muscle activated during movement. All movements are initiated around your center/ core. In physical therapy we often use the term proximal stability before distal mobility. This simply means that your body is wired to be stable around your center first before you can move. One of the causes of instability is that the tva does not work as well as it should. A sedentary lifestyle, prolonged sitting, inflexibility in the spine and hips, obesity and excess abdominal fat, and lower back injuries or surgeries can all decrease the ability of the tva to stabilize the spine. When you do any core exercise that pulls in the belly button, you work the transversus abdominus and help to increase your spine stability. The lumbar multifidus works with the tva to stabilize the spine. The multifidus is a deep lower back muscle that rotates and extends the spine. The same physiotherapists in Australia found that the multifidus is the second muscle that is activated during movement. When you move your arms or legs, the tva and multifidus stabilize the low back. When you pull in your belly button, both the tva and multifidus contract to protect your lower back. Pulling in your abs is an important part of any exercise, because it works the deep muscles. The drawing in maneuver is the most important core exercise to master. It is simple to perform, and it helps to re-train the deep core muscles. You can perform the exercise in many positions, but let's look at lying on your back. Starting Position: Lie on your back, with your knees bent and your feet flat. Form: Simply pull your belly button in and towards your spine. Try to get your belly button all the way to your back. Hold for 10 seconds and then release. Repeat 10 times. Personal Training Tips: You can use an object to make sure you're doing this exercise correctly. Place the object over your belly button and attempt to lower the object as much as you can. This exercise is different from flexing your abs. When you flex your abs, your stomach stays the same size and just tightens. For this exercise, you need to pull in and reduce the size of your waist. When performing other core exercises keep the drawing in maneuver in mind. When a trainer or therapist says pull in your abs, they are referring to the drawing in maneuver. If you have suffered from lower back pain in the past the drawing in manuever is an important core exercise for you to master. If you want to support good posture and protect your lower back, you should use the drawing in manuever in your core exercise program and also incorporate it into your regular workouts. I hope this gives you a better understanding about how some physical therapists approach increasing spinal stability. The drawing in manuever is just the foundation, so once you've mastered this exercise you can step up the intensity of your core workout. 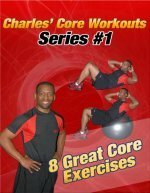 For a great core workout, try my core workout dvd and let me help you strengthen your core.